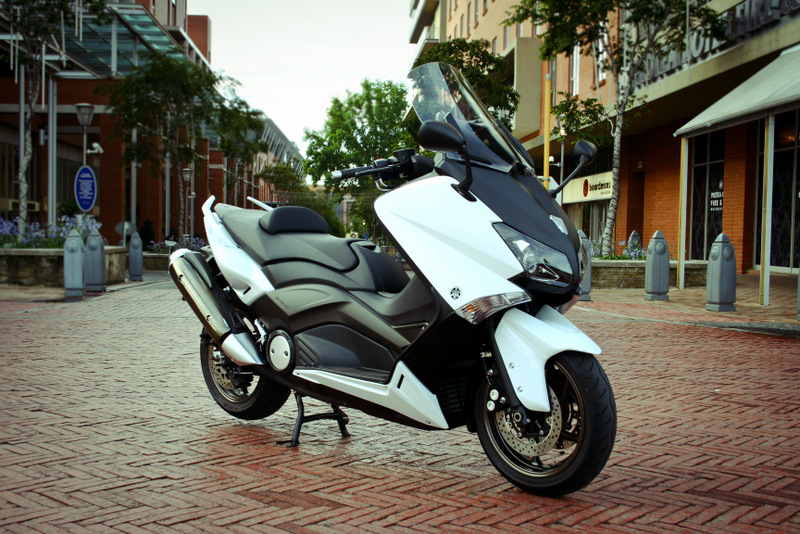 The Yamaha T-Max is technically a scooter, but things have moved on a bit since Yamaha gave us the Passola, those more-noise-than-motion two-stroke irritations from the 70s and 80s. 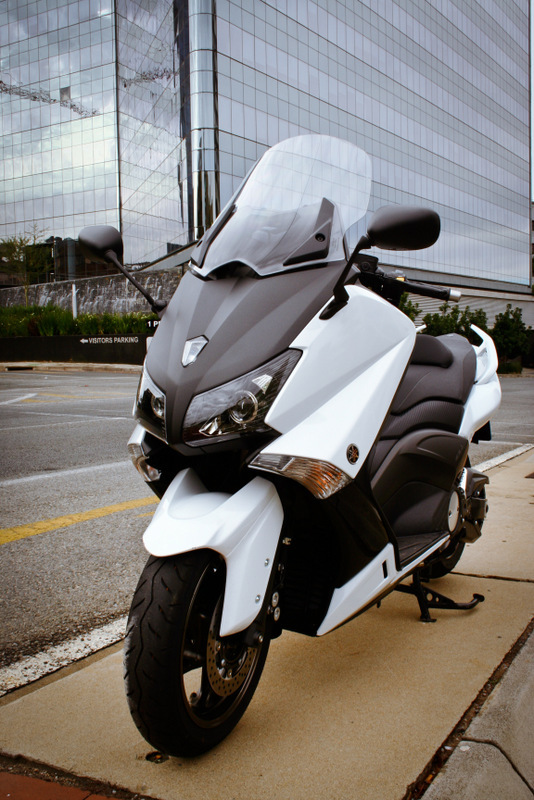 This is the new 530cc T-Max, recently released as an upgrade of the first-generation, 500cc edition from 2001. It’s part of the recent trend of large displacement scooters (called maxi-scooters) that are purpose-built for commuting in cramped cities and heavy traffic. This is a proper, modern low-emission engine based on the latest engineering principles. Double-overhead camshaft, four valves per cylinder, large intake valves and combustion chambers designed for optimal ignition all make for a well-designed, effective power unit. 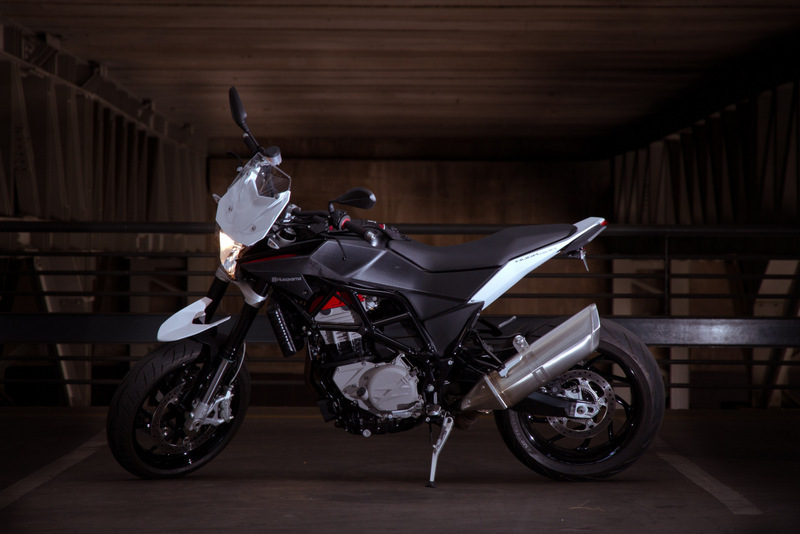 The 530cc, parallel twin uses a belt for final drive and, conveniently, there’s an automatic V-belt transmission – no clutch or gear changes. In typical scooter fashion you just twist the throttle and go. 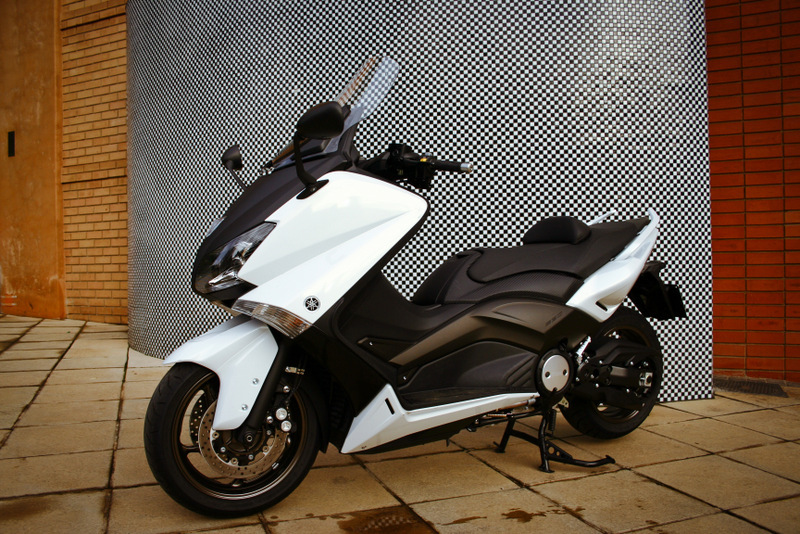 The T-Max has a super-comfy seat and rather funky instrumentation design, both practical and appealing to look at. The windscreen is adjustable, but only using a hex key, which is cumbersome. The little cubbyhole cover is flimsy, but it puts a garage card conveniently within reach at toll booths. Your helmet can be stored under the seat; enough space for two would have been better, so a top box will be a useful addition (if you don’t mind looking like the pizza delivery guy – ed). The single dumbest thing about the Max is that to operate the locking mechanism for the storage bay, you need two hands free – one to turn the key and the other to lift the lid. Inevitably, you will have something like a helmet in one hand, which you then have to put down first. Night riding is no problem as the headlights are exceptionally good. There’s a pair of large handles for the pillion passenger to hold on to. ABS is an option. 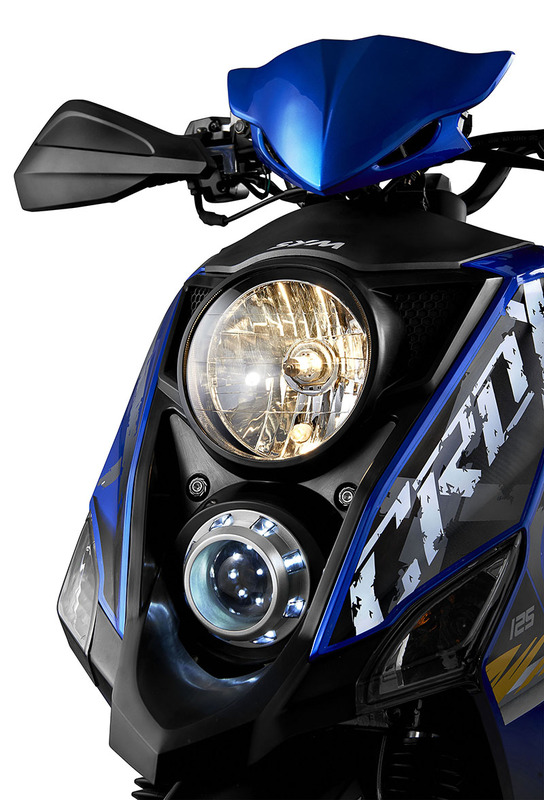 To reduce weight, Yamaha redesigned the frame, which is a lightweight aluminum unit. Lighter wheels than on its predecessor also help keep the weight down and the 33.5kW and 52Nm is more than enough to push you back into the seat when accelerating. Don’t pay too much attention to peak power because the availability of the power at different speeds is what is needed to handle varying traffic conditions. Yamaha paid specific attention to this with the 530cc version and it is apparent that their efforts paid off. Merging in and out of traffic at any speed is exceptionally easy. In short, when you twist the throttle there is enough power and torque to pull you out of traffic and past that dodgy Corolla without a number plate. 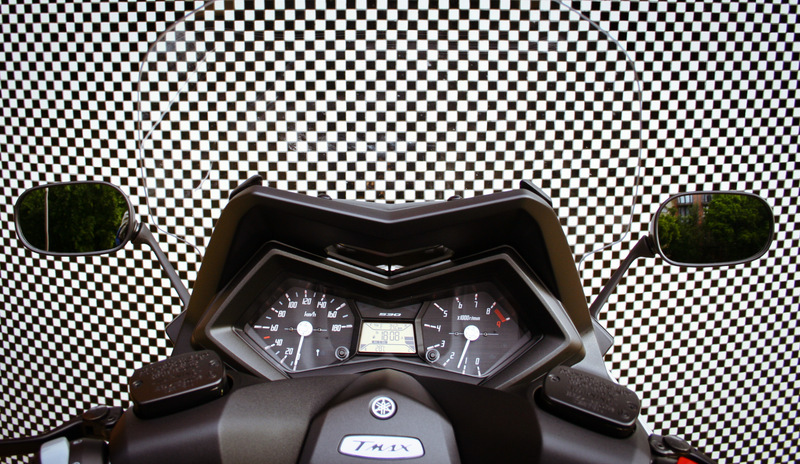 Soon to become a cliché is that everyone who has ridden a T-Max will talk about the look on motorists’ faces when being overtaken at 120km/h by a scooter. Handling and ride comfort were as welcome a surprise as the acceleration. 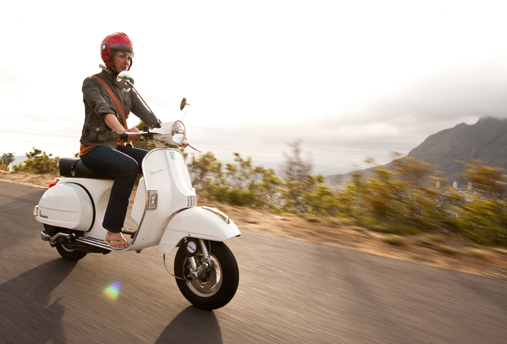 The suspension is very reactive and large-diameter wheels, for a scooter, add to high-speed comfort and handling stability. The test unit was without the optional ABS, but the dual front, single rear disk brakes were nonetheless very effective. When idling, the CVT autobox is not engaged and you need just a small turn of the throttle to amble along at a stroll. This makes squeezing through stationary or slow-moving traffic a breeze and the autobox ensures you’re in the right “gear” for immediate acceleration as the traffic starts to flow. Like: For commuting it’s hard to fault and as a city runabout for bread-and-milk trips it excels. That little cubby hole, although a bit flimsy, is a nifty feature. Dislike: The price is a problem, as is the limited under-seat storage space.